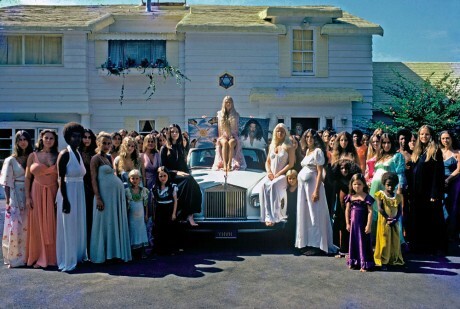 This March the SXSW film festival will be world premiering THE SOURCE, the long-awaited documentary on Los Angeles’ fabled cult-commune the Source Family for their Documentary Feature Competition! THE SOURCE is one of only eight films chosen from over 840 to compete for awards. The film was directed by Process Media Co-founder Jodi Wille and commercial director Maria Demopoulos, who will both be in attendance at the screening. Also attending will be Process Media/Feral House founder Adam Parfrey and very special guests Source Family members Electricity, Isis, Magus and Pan Aquarian, and more, who will be doing a Q&A after the screening. There have also been rumors that YaHoWha 13 might make a surprise appearance and performance! Wille, Parfrey, and Isis and Electricity Aquarian will be appearing before the premiere on Thursday March 8 for a book signing of The Source and Parfrey’s new Feral House book Ritual America, and Austin’s Domy Books. A multi-media presentation about The Source will occur at 6 pm sharp, and will culminate at 7 pm, when Jodi Wille, Isis and Electricity will sign books. At 7:30 Adam will carry on with his image-enhanced lecture about American secret societies. It’s 1971 and communes and new religions are on the rise. The Source Family are an “Aquarian tribe,” a secretive ?but outlandish group of 140 beautiful young people who stroll Los Angeles? in colorful robes, devotees of “Father Yod,” a controversial restaurateur-turned-spiritual leader with fourteen wives and his own psychedelic rock band. The Family lives in a mansion and operates a popular restaurant on the Sunset Strip, serving vegetarian cuisine to musicians and movie stars, pioneering a national trend. But their radical lifestyle instigates the authorities. Their demise is dramatic and painful, but Yod’s spirit lives on.